Late Paleozoic mafic-intermediate intrusions are widespread in the central Tianshan belt, but their tectonic settings remain controversial. Petrogenesis of these intrusions can provide insights into the tectonic evolution of the belt and its adjacent areas. 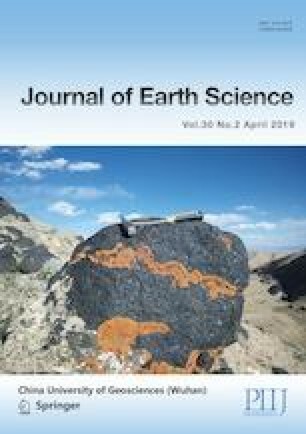 This study presents new whole-rock geochemical and zircon U-Pb geochronology and Hf isotopic data for the Yaxi diorite and Qianzishan gabbro on the northern margin of the central Tianshan (NW China). Zircon U-Pb dating yielded the magma crystallization ages of 313±4 and 295±4 Ma for the Yaxi diorite and Qianzishan gabbro, respectively. They have lower Mg# values, Ni and Cr contents than typical mantle-derived primary melt, with negative correlations between MgO, TFeO and SiO 2 contents, indicating clinopyroxene and olivine fractionation during magma evolution. They are characterized by enrichment of large ion lithophile elements (e.g., Rb, Ba and Sr) and depletion of high field strength elements (e.g., Nb, Ta and Ti) with high Ba/Th and Rb/Y, suggesting that their mantle sources had been metasomatized by slab-derived fluids. In addition, the Qianzishan gabbro has high Al2O3 contents (19.54 wt.%–20.88 wt.%) and positive Eu anomalies (Eu/Eu*=1.09–1.42), which can be attributed to accumulation of plagioclase. Geochemical and zircon Hf isotopic compositions reveal that both the Yaxi diorite and Qianzishan gabbro were derived from depleted lithospheric mantle in the spinel stability field with insignificant crustal contamination. In association with previous investigations, we suggest that the Yaxi and Qianzishan intrusions were emplaced in a subduction-related environment, which means that the subduction of the Junggar Ocean lasted at least to the earliest Permian. Supplementary material is available for this article at https://doi.org/10.1007/s12583-018-1205-6 and is accessible for authorized users. This research was supported by the Key Laboratory of Xinjiang Uygur Autonomous Region (No. 2016D03002), the National Natural Science Foundation of China (No. 41562010) and the China Postdoctoral Science Foundation (No. 2017M613257) and Doctoral Scientific Research Foundation of Xinjiang University (No. BS100127). Constructive comments from two anonymous reviewers and guidance from the editors are greatly appreciated. The final publication is available at Springer via https://doi.org/10.1007/s12583-018-1205-6.